Every year about this time I become more aware of my surroundings and of the changes taking place outdoors. The first thing I notice is those first few trees and bushes that start putting on their fall color show. Then I start to notice how the smell of the air changes and how it becomes crisper and fresher. Then my mind wanders and I daydream about hearing fallen leaves crunching under my feet as I take a hike and see the brilliant yellows, oranges and reds of the leaves. Then reality hits when one of those yellow jackets that seem to be everywhere this time of year stings me. Then I start to think about how I have to start getting out sweatshirts to wear at night and how it won't be long before fall will be over and I'll start seeing that four letter "s" word stuff - snow. But even though Fall brings to mind both good and bad things (doesn't almost everything?) it's still my absolute favorite time of year to go camping. With that in mind, this week's posts are going to be a series of some great fall camping destinations where you can not only enjoy the beautiful scenery and partake of the bounty of fall (aren't fresh crisp apples one of the most wonderful things? ), but also enjoy a few more days outside in the fresh air, and get cozy around a few more campfires before winter arrives and many of us pack our camping gear away until next year. The states featured in this 5-day series will be: Vermont, Michigan, North Carolina, Georgia and Oregon. First up is my favorite - Vermont. 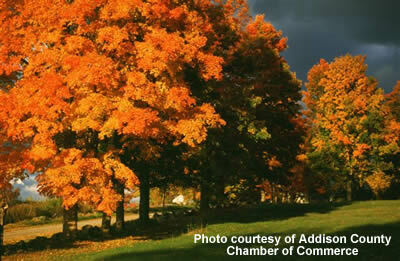 VERMONT Vermont is considered the crown jewel of states to visit in the fall. Pictures don't do the area justice even though the pictures of the fall colors are breathtaking! 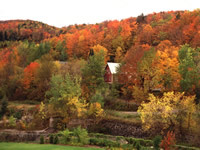 My husband and I took our first trip to Vermont 8 years ago and even though we planned the trip a little late in the season when color was past peak, the color was still breathtaking. We took the trip just before we were bit by the "camping bug" so it was a car trip with nights spent in local hotels. I'm hoping to go on another trip to Vermont in the next year or two, this time with my camper. Since I have a pop-up I shouldn't have problems towing on the roads in Vermont, but if you are towing a large trailer, 5th wheel or have a Class C or Class A Motorhome, keep in mind that some roads in the state are little more than rugged dirt paths and some of the mountain roads are narrow, steep, and kind of scary (scratch -the "kind of " - some of them were really scary to me but I'm kind of a wuss). So if you're camping with a bigger rig, or any tow vehicle, my suggestion is to find a campground to stay at for the the duration of your stay in the state or maybe pick 2 (one in the Northern part of the state and one in the Southern part of the state, splitting your trip into 2 segments) and take day trips around the area with your car, truck or motorcycle. Now, let's talk about the gorgeous fall colors. If you're wondering why the color is so much better in Vermont and the other New England states it's because the area has many more deciduous trees that turn colors and shed their leaves each year (hardwoods like maple, oak and beech) than coniferous trees which usually stay green and don't shed their leaves (pine, spruce and cedar trees). That means when the leaves start turning the area is awash in the brilliant yellows, oranges, and reds we typically associate with fall with few "green" trees breaking up that colorful view. That is why Vermont is considered the number 1 destination in the United States to view spectacular color and why reservations are highly recommended during the peak viewing season (Columbus day weekend is typically considered the peak foliage weekend and falls on October 11 and 12 in 2008) although color starts showing around mid-September and goes as late as the first part of November. The northern parts of the state have peak color earlier than the southern portions but instead of guessing when to go, check out the color forecast at Vermont Vacations and click here for their current fall foliage report. If you'll be away from an Internet connection, call 1.800.VERMONT (1.800.837.6668). 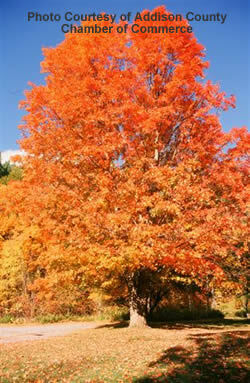 As the fall color season gets into high gear, the hotline will have updates twice a week (on Tuesdays and Thursdays). The great news for 2008 is that color is expected to be great because of warm weather and rain in the early part of summer that helped the trees develop healthy and strong leaves. 1 - the first two weekends in October are the busiest of the entire year so make reservations (including campsite reservations) as early as possible. 3 - think about staying in another state and driving to Vermont. Vermont is not that wide - only about 80 miles. Vermont has many residents who commute daily to either New York State, New Hampshire or Massachusetts for their job. East to west driving in Vermont can be a little tricky though. I remember when we were there we thought a trip was only going to take about 30 minutes because our destination was only 25 miles away but we forgot about the mountains we had to drive through to get there. Where to stay - Sue from the Addison County Chamber of Commerce was kind enough to provide information on area campgrounds. View the list by clicking here (it includes both private and state campgrounds). If you've read my blog posts in the past you know I'm a fan of the campgrounds at state parks because they are typically roomier, have more nature themed amenities like hiking trails, bike trails, and fishing, and most importantly to me - they are almost always cheaper. The downside is that they often don't have as many amenities as private campgrounds (such as electricity and water hookups) plus there may not be many sites large enough to accommodate large RV's (if you're curious about why that is, it's because most state parks were built over 50 years ago when campers and RV's were smaller). Several of the state campgrounds in Vermont are already closed for the season, with many more closing by mid-October so call ahead if you want to stay at a state campground to be sure it's open and to be sure it will accommodate your camping rig. Otherwise, there are plenty of great private campgrounds as well. 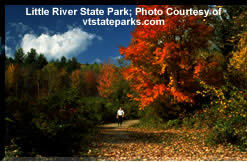 Mid-Vermont's most popular state campground is Little River State Park, 30 miles south of Burlington. It's open through Columbus Day weekend and has 81 tent/trailer campsites and 20 lean to sites. It was named Park of the Year. As a bonus, it's not far from Ben and Jerry's Ice Cream Factory! I went there on my trip to Vermont, took a tour, and had some delicious ice cream. And if you're a cheese fan, it's only about 34 miles from Ben and Jerry's to Cabot Farms for their factory tour (yes, I know they are 2 very "touristy" things to do but I was a tourist when I was there and was happy to play the part - I took a tour of the Vermont Teddy Bear Company too). Beautiful Fall Drives In Vermont Sue from the Addison County Chamber of Commerce says that any drive over the Green Mountains in Vermont is beautiful in the fall. There are 4 gaps that can be driven in a day or two and they all pretty much run between Rte 100 to the east of the mountains and Rte 7 to the west of the mountains. Here are 5 recommended drives (4 gap drives through the mountains and one non-mountain drive): 1 - Rte 73 which runs west to east between Brandon, Vermont and just south of Rochester, Vermont, going over the Brandon Gap. Take a break in Brandon to walk around their downtown and have lunch at one of their restaurants. Brandon is also one of the gateway villages to the Moosalamoo National Recreation Area which is in the heart of the 400,000 acre Green Mountain National Forest. The Moosalamoo Recreation area has over 70 miles of trails for hiking, biking and horseback riding but a flood in August damaged some trails and roads so check the Green Mountain Forest Conditions web page for closures or call the forest office at 1.802.747.6700 before heading out. Branbury State Park on Lake Dunmore is near Rte 73. It has 22 tent campsites and 6 lean-to campsites. The park is open from Memorial Day through Columbus Day weekend. 2 - Rte 125, west to east from E. Middlebury over Breadloaf Mountain/Middlebury Gap to Hancock. The views are great but the road isn't so great. Because of flooding in August there is dirt and gravel along some of the road surface edges although the road is open, but only to passenger vehicles in some areas. The Robert Frost Interpretive Trail is just off Rte 125, about about halfway between Ripton village and the Breadloaf School of English. It's an easy walk through a woods a little over a mile long where people can pause to read markers with Frost's poems written on them. The walk is meant to show people what one of the walks in the woods was like when Robert Frost took them while thinking about his writing. Maybe the walk will inspire the inner poet in you! 3 - Rte 116 from Bristol east over the Lincoln Gap to Warren. 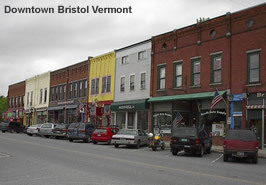 Both Bristol and Warren have nice downtown areas. Note that some of the road surface at the peak is dirt. Bristol is celebrating their annual Harvest Fest on September 27, 2008. The festival offers family fun with music, horse/wagon rides, children's activities, a craft festival, the "Taste of Bristol", a kid's area, and bandstand music. Car enthusiasts should stick around the next day, September 28, 2008 for Bristol's 4th annual Better L8 Than Never Car show that will features 26 classes of vehicles to drool over, 10 "best of" trophies, muffler raps, music and lots of delicious food. 4 - Rte 17 from Bristol over the Appalachian Gap to Waitsfield is an especially beautiful day drive with lots of scenery. The road is completely paved but it does have lots of twists and tight turns. 5 - For a nice drive that's not in the mountains but has nice views of Lake Champlain and the Adirondacks, drive along Vermont's "coast" (Routes 17, 22A and 125 all skirt along the edge of the shoreline of Lake Champlain). Start at the city of Vergennes where there are nice shops and good restaurants. If you'd rather stay at a cottage than camp, check out the Basin Harbor Club (click here to take a photo tour of their cottages)on Lake Champlain where you'll have a front row seat to watch the migration of waterfowl that are heading south to a warmer climate for the winter. For great camping with a view of Lake Champlain and the Adirondacks, check out Button Bay State Park. It has 73 campsites, and 13 lean-to's. The campground is open from Memorial Day Weekend through Columbus Day weekend. Getting Some Exercise in Vermont Walking on a treadmill or being a gym rat may be some people's idea of great exercise but many others would rather be active outside in the fresh air. There's plenty of opportunities for great outdoor activity in Vermont. Click here for some great bike trail guides. There are lots of choices including: Lake Champlain Region Bikeways Map and Guide, Heart of Vermont Bikeways, Adirondack Coast Bikeways, Northern Adirondack Coast Bikeways, Cycle the City (Burlington), Island Line Trail, Champlain Islands Bikeways, Northwest Dairyland, Franklin County Bicycle and Walking Guide, Guide to the Missisquoi Valley Rail Trail and Bicycling Along the Richelieu River. Whew! I got tired just typing out all those choices. 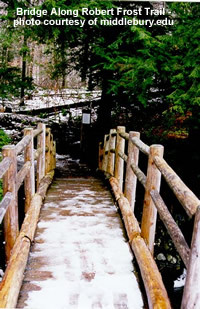 For hiking trail information visit VTLiving.com. How About Something Delicious All that biking and hiking in the crisp fall air is bound to work up an appetite. How about some fresh, juicy, crisp apples? 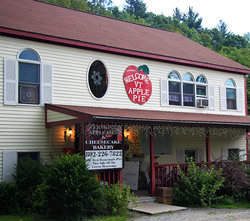 Click here for a list of Vermont apple orchards. If you prefer something even sweeter, like delicious, pure Vermont maple syrup (and other maple products), stop at one of the numerous roadstands in Vermont or click here for a list of sugarhouses that are open year-round. Lastly, this article about Vermont wouldn't be complete if I didn't mention the covered bridges. I saw several when I was there and enjoyed every one of them. Many have weight restrictions so you may not be able to drive over them if you have a large RV or trailer, but you can still stop, look, and maybe ask other people also looking if they'll take your picture. My husband and I did that while we were there and we had the good fortune to hand our camera to a professional photographer. We got a great picture but that was before my "digital camera" age so I'm unable to share it here. But most of all, no matter what you do while visiting Vermont, relax and enjoy yourself - and see if you can catch a glimpse of a moose. That's the one thing I never saw while I was there even though I kept my eyes on the lookout for them(at least while I wasn't watching for falling rocks!). And, for a great "armchair tour" of Vermont to give you a taste of how beautiful the area is, watch the Webshots Vermont slideshow below.